The collision idea was first popularized in 1980 by Luis and Walter Alvarez and others (Alvarez, et al., 1980). They were studying a one centimeter-thick clay layer in Italy which forms a boundary between the Cretaceous and Tertiary geologic periods. This transition marks the end of the Mesozoic era, sometimes called the "age of the dinosaurs." The layer is commonly called the K-T boundary, using the German spelling for the word Cretaceous, and marks the assumed extinction of the dinosaurs, about 65 million years ago. Teamwork between geology and physics laboratories identified the heavy metal element iridium (Ir) in the clay boundary layer. Iridium is known to be more abundant in meteorites, asteroids, and comets than on earth. Thus the discovered iridium concentration supports the idea of dust fallout from an extraterrestrial impact. Iridium was later found in the K-T layer in locations as widely separated as Italy, Denmark, and New Zealand. The collision idea for the death of the dinosaurs was of limited interest during the 1980s, just one of many proposals. Then around 1990, a particular formation of faulted rocks received major attention, located at the northern end of Mexico's Yucatan peninsula (figure 1). The geologic formation is called Chicxulub (pronounced CHEEK-shoe-lube) after a nearby village. The roughly circular feature is 100-200 miles in diameter. It is buried a kilometer below ground, about half on land and half below the sea floor. Figure 1. 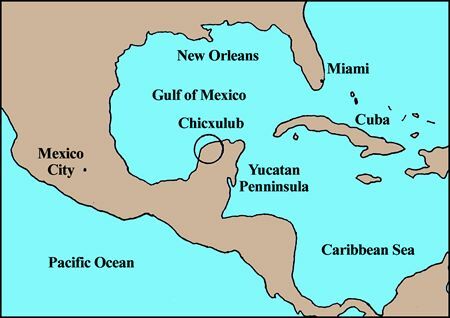 Location of the Chicxulub crater (circle) on Mexico's Yucatan Peninsula. The underground shape is revealed by gravitational and magnetic anomalies measured at the earth's surface. Samples of unaltered glass from drilling have been dated by the argon-argon method, with a reported age of 64.98 ± .05 million years (Swisher III, et al., 1992). The researchers also assign the very same age to tektite glass rubble found in Haiti, 1,200 miles away. Tektites are bits of colored glass, formed from melted quartz minerals, heated by impact. A problem has arisen with the report of out-of-place Cretaceous sediments found above the Chicxulub crater layer (Ramos, 1975). This may indicate that the crater is too old to define the K-T transition. Others have suggested that these sediments are misdated, or else are blast material which later fell back to the ground (Swisher III, et al., 1992). The gradual recognition of the important underground Mexican formation is a fascinating story of oil company secrecy, lost well logs, and skepticism from geologists. As late as 1987, a popular book about earth craters makes no mention of Chicxulub (Mark, 1987). Chicxulub is probably a crater, although doubts persist since it remains hidden underground. There are other cryptocrater formations across the earth which alternately may be related to volcanism or erosional sinkholes. No one is certain of their origin. Whether or not Chicxulub represents an actual impact, the presumed event can be imagined. The colliding object, probably a comet or asteroid, was about 10 km in diameter and weighed 6 x 1014 kg, or nearly a trillion tons. The generic name for such a large impactor from space is a bolide. If this bolide contained 500 ppb (.5 parts per million) of iridium, the total iridium later dispersed around the world would be 300 million kilograms. The object was traveling at a typical space velocity of 20 km/sec (12 miles/sec), several times faster than a bullet. Its total kinetic energy then was dissipated as heat and rock displacement at the point of impact. The release amounted to about 1023 joules, or 108 megatons of TNT. This energy is 10,000 times greater than the world's total arsenal of nuclear weapons at the height of the Cold War (Cowen, 1996). The figure is also the approximate total energy released when fragments of comet Shoemaker-Levi struck the planet Jupiter in 1994. Billions of tons of pulverized theoritically rocks were blown skyward by the Chicxulub impact for miles. As the larger pieces fell back, they heated to incandescence and ignited firestorms on the ground across entire continents. Soot and dust circled the earth, darkening the sun for months or years. Global cooling may have lasted for decades. Photosynthesis ceased and food chains collapsed. Sulfur was injected into the stratosphere, forming sulfuric acid rain. The ozone layer was temporarily destroyed by atmospheric turbulence. Actually, of course, these supposed climatic effects from such a hypothesized collision are very uncertain. Regardless, the scenario sees the dinosaurs, marine reptiles, flying reptiles, and much other life extinguished in a mere instant of geologic time from this ecological disaster. Scientific support for the dinosaur-collision hypothesis is not unanimous. Evolutionary paleontologists, especially, question the sudden loss of so many varied species. Most prefer a gradual extinction of life from climatic changes, sea-level variations, or volcanism. Three basic questions will be raised here that are considered within the old-earth time scales. Second, the fossil record does not show an instantaneous demise of the dinosaurs. Some dinosaurs died out within the Cretaceous period while others apparently survived well into the Tertiary period, millions of years later in evolutionary thinking (Rigby, et al., 1987; Sloan, et al., 1986). Another major problem is in determining where the K-T boundary itself actually lies. In certain locations, the shocked quartz grains appear to cover a sedimentary thickness or time span of at least 500,000 years (Courtillot, 1990). Also, in fossil-rich eastern Montana, the iridium layer is found two-three meters above the highest in situ dinosaur remains (Archibold, 1982). In this location, it thus appears that dinosaurs disappeared long before any collision event. Third, it is not certain that Chicxulub is an actual impact site. Practically all the data in support of a collision have alternative explanations. For example, the iridium concentration in the K-T layer could have resulted from volcanic processes. Igneous material includes traces of iridium, especially when derived from the deep mantle (Ganter, 1986). A large region in western India (called the Deccan Traps) experienced massive volcanism at a similar relative time in history. Some experts attribute dinosaur death to climatic events related to this massive outpouring of lava in India. In the evolution view there have been at least five major extinctions of life during earth history. We may expect continued zealous efforts in coming years to tie these alleged extinctions to crater-like blemishes across the earth. Creationists challenge the time scale which widely separates these extinction events. In one alternative view, there was just one single major earth catastrophe of judgment which caused the near extinction of life, the Genesis flood of Noah's day. Thus the separate extinctions actually are closely related episodes taking place during the year-long global flood. The K-T clay layer is just one small portion of sediment accumulation during the flood. There was both volcanic and collision activity associated with the flood, perhaps including Chicxulub and other craters (Froede and DeYoung, 1996). However, the dinosaurs were not driven to extinction at this time. Instead, living dinosaur types were sheltered aboard the Ark. They then gradually disappeared in post-flood centuries due to climate changes and other possible causes. Several dramatic movies have portrayed deadly asteroids or comets pummeling the earth and endangering humanity itself in the years to come. The creation view is far more optimistic about the future, realizing that there is a definite future plan for mankind. We are not the result of chance, nor do we, or the earth's animal and plant life, face imminent extermination from a random space collision. Alvarez, L.W., W. Alvarez, F. Asaro, and H. V. Michel. 1980. Extraterrestrial Causes for the Cretaceous-Tertiary Extinction. Science 208 (4448): 1095-1108. Archibold, J. D. 1982. A Study of Mammalia and Geology Across the Cretaceous-Tertiary Boundary in Garfield County, Montana. University of California Publications in Geological Sciences. 122: 1-286. Courtillot, V. 1990. A Volcanic Eruption. Scientific America 263 (4): 85-92. Cowen, R. 1996. The Day the Dinosaurs Died. Astronomy 24 (4): 34-41. Froede, C. and D. DeYoung. 1996. Impact Events Within the Young-Earth Flood Model. CRS Quarterly 33 (1): 23-34. Gunter, F. 1986. Principles of Isotope Geology. John Wiley and Sons. New York. Kerr, R. A. 1983. Isotopes Add Support for Asteroid Impact. Science 222: 603-604. Ramos, E. L. 1975. The Gulf of Mexico and the Caribbean. Volume 3 of The Ocean Basins and Margins. Nairn, A. E. M. and F. G. Stehli, eds. Plenum. New York. Rigby, J. K., K. R. Newman, J. Smit, S. Vander Kaars, R. E. Sloan and J. K. Rigby. 1987. Dinosaurs from the Paleocene Part of the Hell Creek Formation, McCone County, Montana. Palaios 2: 296-302. Sloan, R. E., J. K. Rigby, Jr., L. Van Valen and D. Gabriel. 1986. Gradual Dinosaur Extinction and Simultaneous Ungulate Radiation in the Hell Creek Formation. Science 232: 629-633. Swisher III, C. C., J. M. Grajales-Nishimura, A. Montanari, S. V. Margolis, P. Claeys, W. Alvarez, P. Renne, E. Cedillo-Pardo, F. J. Maurrasse, G. H. Curtis, J. Smit and M. O. McWilliams. 1992. Coeval Ar-40/Ar-39. Ages of 65 Million Years Ago from Chicxulub Crater Melt Rock and Cretaceous-Tertiary Boundary Tektites. Science 257 (5072): 954-958. * Don B. DeYoung is an adjunct faculty member at ICR. Cite this article: Donald B. DeYoung, Ph.D. 2001. Chicxulub and the Demise of the Dinosaurs. Acts & Facts. 30 (4).